ETCETERA, New World School of the Arts’ 2019 BFA final visual arts showcase is a group exhibition highlighting a variety of works from 24 visual artists of divergent disciplines, professionally curated by NWSA dean of the visual arts program, Maggy Cuesta, and gallerist Fredric Snitzer. A culmination of four years of intensive study, ETCETERA reflects the hard work and dedication of a bold and dynamic group of emerging artists whose objective for this exhibition is to explore and exploit hybridity in various ways. This year’s BFA exhibition will be presented in five separate galleries housed by Mana Contemporary, a break from previous years’ one-gallery show. 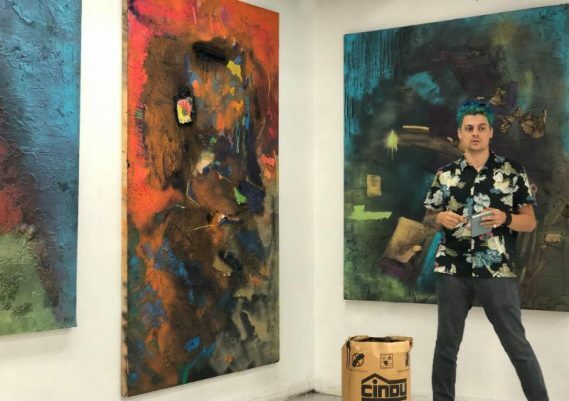 Situated in the heart of downtown Miami, the adjacent exhibition spaces will highlight the work of different graduating students encouraging the viewer to stroll from gallery to gallery in order to see the complete exhibition. “It’s a more unique experience for guests and it offers easy access to those using public transportation. This allows the community to meet the next generation of visual artists. It also enhances the arts and culture scene in the area,” said NWSA dean Cuesta. “This fragmented setting affords each student more exhibition space, which to them translates into a larger canvas for their body of work.” Live music will welcome guests to the series of galleries along with delectable hors d’oeuvres and wine. Exhibiting students include: Diane Amaya, Gabriela Beltran, Maria Benitez, Carla Camejo, Annette Delgado, Faith Falodun, Maria Franco, Corey-Lynn Gomez, Alexis Hotchner, Jean Lopez, Lissette Lopez, Michael Lopez, Marianela Manzanilla, Oscar Medrano, Yusimy Lara Menendez, Nicole Mijares, Kara Nettleton, Patrick Olson, Keila Pimienta, Doralis Ponce, Lisbet Romero, Holli Salazar, Chazney Thomas, Juan Urbina.